FRESNO- For the second game in a row, the Grizzlies got a big blast from one of their new additions. 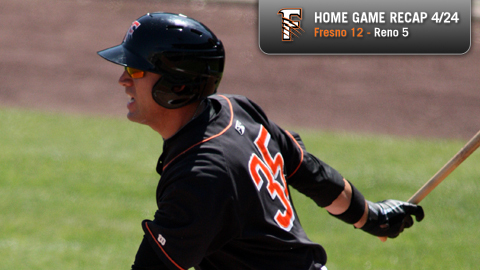 Travis Ishikawa hit a grand slam as Fresno broke out for its highest-scoring game of the season, riding an eight-run fifth to a 12-5 victory over the Reno Aces on Easter Sunday at Chukchansi Park. The Grizzlies (9-9) sent 13 batters to the plate in the inning, collecting four hits, four walks and two hit batters. It was almost the biggest inning of the year for the home side, falling just shy of the nine-run eighth frame that Fresno posted against Las Vegas on Opening Day. For the second straight game since his return to Fresno, Brandon Belt helped the Grizzlies get on the board first. After Conor Gillaspie singled with one out in the opening frame, Belt followed with a double that dropped on the foul line in right field, allowing Gillaspie to race all the way around to score. Collin Cowgill leveled the score at one apiece with a thundering solo shot over the back gate in left-center field and onto the Fulton Mall in the top of the third. But the Grizzlies forged ahead for good with two runs on four straight hits in the bottom of the fourth, including RBI-doubles by Ishikawa and Thomas Neal. Fresno then broke the game open with the eight-run fifth. Ryan Rohlinger's team-leading fourth home run in the seventh inning capped the scoring for the Grizzlies. Matt Yourkin earned his first victory of the season, allowing four runs over 5.1 innings of work, striking out six. Yourkin (1-2) had a scary moment in the fifth inning when he was hit in the right wrist by a Kevin Mulvey (1-2) pitch and doubled over in pain. However, it was not on the southpaw's pitching hand, and he remained in the game. Ishikawa finished the day 2-for-5 with the double, the slam, two runs scored and a Grizzlies season-high five RBI. Meanwhile, Neal was 3-for-5 with a double, a run scored and an RBI, notching his second three-hit performance in his last three games to raise his average to .342. The Grizzlies plated a season high 12 runs on 17 hits. Fresno had scored 11 runs twice before, in its Opening Day victory at home and again in its road opener on April 15th, both against Las Vegas. The series continues Monday night at 7:05pm as the Grizzlies send righty Doug Mathis (0-1) against Reno right-hander Kyler Newby (0-1).